I have often come across travellers wanting to pursue non-touristy trails in the most touristy places of the world, their penchant for seeing and experiencing things that are outside of the ‘Top 10 things to visit in a country’ , their heart’s nagging desire to make a personal connection, their search for an icon, an image, a flavour, a sentiment and ultimately a truth that hasn’t been projected on them by the media. I know these people, because I am one of them. And if you are one of them, then you too struggle to balance your itinerary with the touristy and the non touristy, between seeing what you ‘must’ and granting yourself the leeway to seek your truth or form an opinion. I know you struggle to find a little head space for serendipity, for wonder and for introspection because thanks to technology, you have little room for these – you already know what a Colosseum, Brandenburg Gate or Van Gogh’s ‘Sunflowers’ looks like. And heck, with google street view you get a quasi-holistic experience of walking by La Seine with the sun on your back. The National Gallery of London lets you take virtual tour of its 18 rooms, where you are free to get as close to the paintings as you want from the comfort of your home. Yes, there are travel snobs who find not following the herd fashionable or romantic, and there are some who say it to emulate them but there are also those who mean it and for them travelling this way isn’t any less fulfilling. It’s only a different perspective. 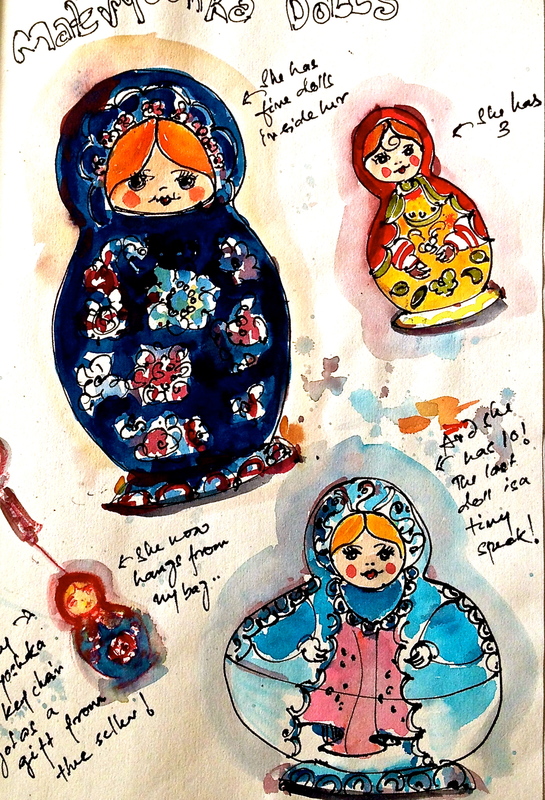 For the exact same period when we traipsed through the city, chained to a guidebook and an itinerary, she walked free on the roads that took her fancy, wandered inside Russian supermarkets and bought local food, visited far off flea markets to get handcrafted souvenirs and sampled Russian cuisine at a restaurant by the lake with swans floating on them. I will always envy these people who don’t have qualms about dismissing a city’s highlights with a wave of their hand, because I would chop my head a hundred times on an imaginary guillotine, if I visited Moscow and skipped the Kremlin. Because there’s a reason why the ‘must sees’ are called such. Because to be a traveler, it’s crucial that I be a tourist first. Leaning against a light post and sketching Kremlin and Red Square which has right now been taken over by the huge shiny square box hosting Dior’s fall winter collection. Fashionistas, models and celebrities are walking in on red carpet as I sketch. The place is teeming with media, photographers and security dressed in black. So here we are standing on the Red square, sweating like pigs, trying to locate the ticket office and entrance to Kremlin which by the way is a 5 mins walk to the right after exiting the Okhotny Ryad metro station and can be reached even if you’re blindfolded. 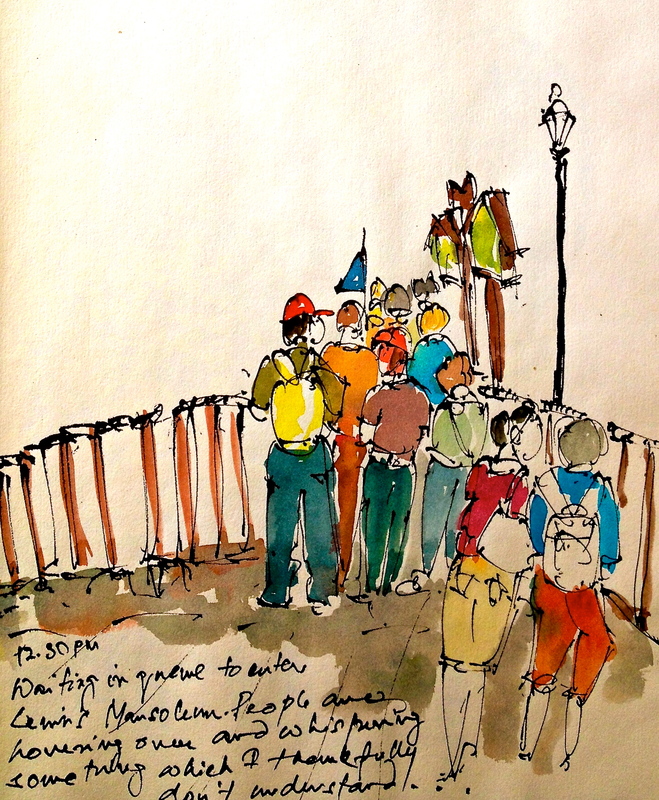 But we are disoriented with a guidebook and a map in hand because this is what perspective changing vastness of the place, crawling with hundreds of people moving in different directions can do to you. 250 roubles and a brisk security check, gets us inside the fortified headquarters of the world’s largest nation with 800 years of history in there, at our disposal. If you’re planning to spend only half a day to see all that, then make it count. Entering through the Trinity gate, we head straight to the Cathedral square, where all the fun is. The walk may be lacklustre with armed guards in uniforms keeping you from deviating from track, though very politely. We pass the Arsenal on the left and the State Kremlin Palace on the right, stopping only briefly at the monstrous Tsar Cannon and Bell for pictures. Cathedral of Assumption is easily one of the most beautiful churches I have ever seen in my lifetime. Of churches, a seasoned traveller once said to me, “After a while everything starts to look the same”. 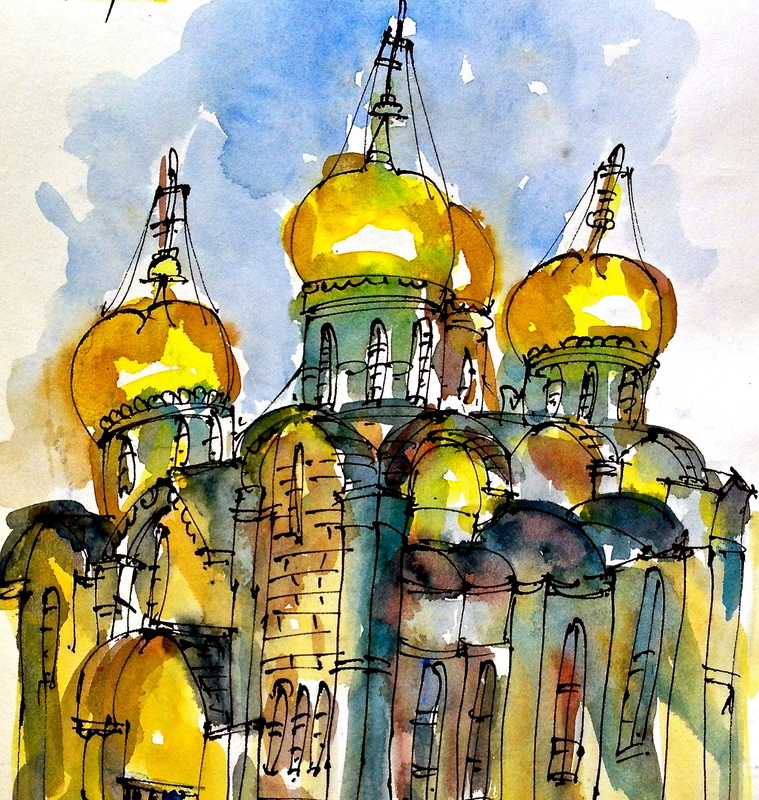 Well, Cathedral of Assumption, the chief cathedral during Russia’s Tsardom and a burial-place for Moscow’s patriarchs and metropolitans, is a class apart. The first impression of walking inside the thickest jungle of ancient frescos, murals, unparalleled iconographies and gilded fixtures covering every inch of the walls, ceiling and pillars, lit in the warm glow of opulent chandeliers, will most assuredly remain with you for a very long time. I settle down on a visitor’s bench, feel the coolness of the stone floor with my bare feet and try to calm a mind that’s giddy with this explosion of colours. 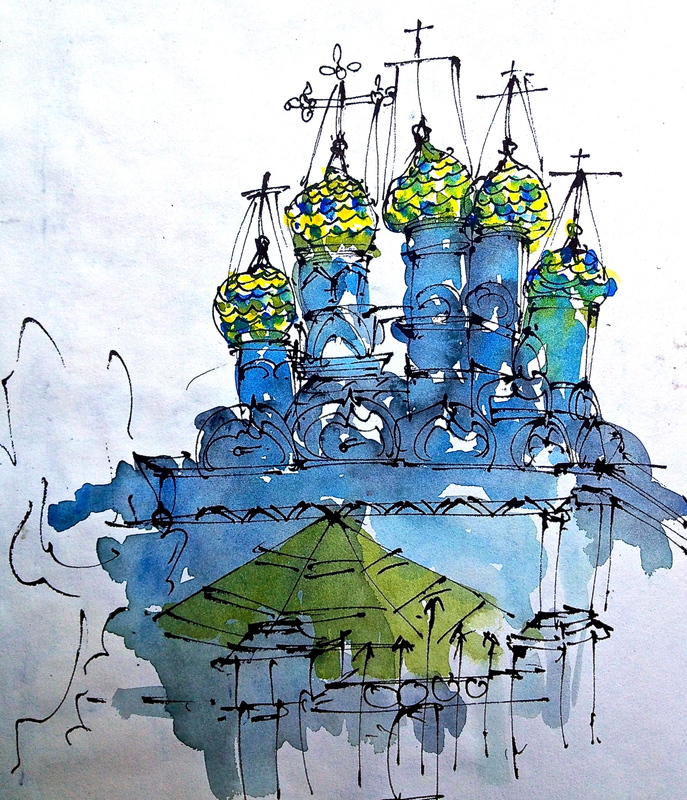 Other marvels to look out for are at a stone’s throw from each other, like the imposing Ivan the Great Bell Tower, the Annunciation Cathedral and the Archangel’s Cathedral which I sketch halfway when the skies open and fat droplets of water start smudging my ink line work. We take shelter inside the nearby Patriarch’s Palace and admire the precious tableware, furniture, jewellery and clothing used by the Tsars. 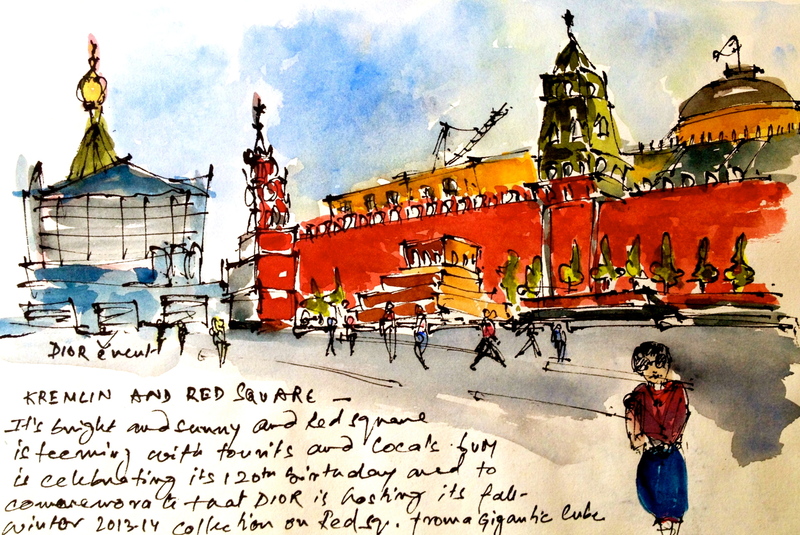 The rain stops, so we exit to the Red Square. 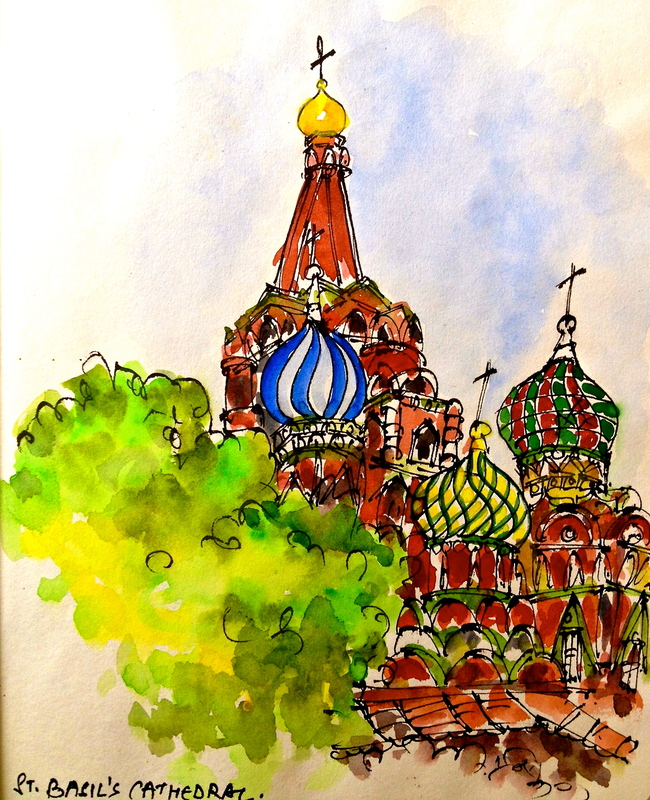 This is my third attempt at sketching St. Basil’s Cathedral. I am sitting in the only shaded spot next to the church and sharing the space with a hopeless drunk. commanding expanse of grey cobblestone space that has seen many congregations and military parades in its Soviet days. Though rain-soaked, Red Square looks riveting with the candy coloured domes of the iconic St. Basil’s Cathedral at its southern tip contrasting the grey sky. While I dedicate multiple sketches to St. Basil, sitting outside on the cobblestones, the interior isn’t something you’ll want to write home about, specially after Kremlin, except some remarkable patterns and designs that make the frescos. If you decide to swing by Lenin’s embalmed body inside Lenin Mausoleum, on Red Square, prepare to come early and stand in a long queue because father of this nation doesn’t charge a cent for your visit and therefore takers are plenty. Surrender camera phones, cameras, bags at the gate, clear security, and be ushered inside a semi dark building guarded by soldiers, where you solemnly and silently walk in a queue around a waxy body lying on granite, inside a glass case. 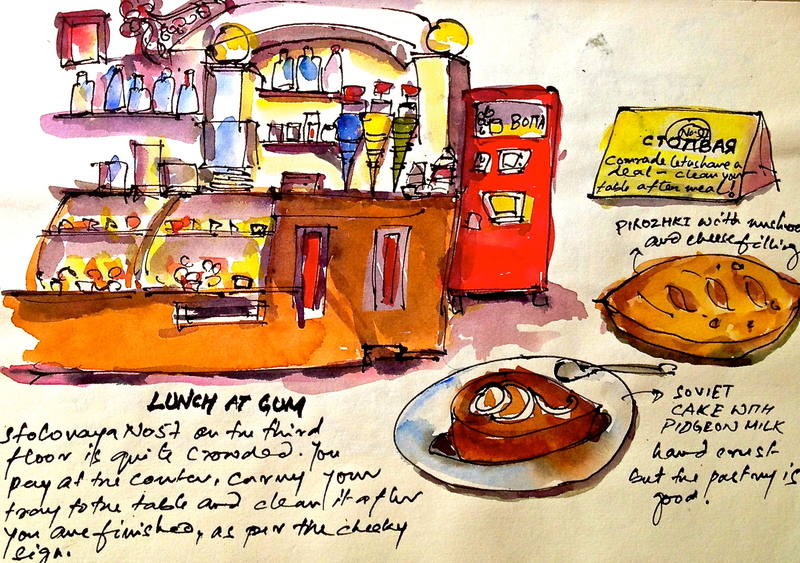 Trying to capture GUM’s 120th anniversary jubilation. If that was slightly macabre for your taste, step into GUM right opposite the mausoleum on the left of Red Square – and feast your eyes on a architecturally stunning, glass roofed, capacious shopping arcade that’s celebrating its 120th birthday this year. Stop by Stolovaya No.57, a Soviet style cafe on the 3rd floor for inexpensive traditional grub. As we were tipped off on the best place to buy Russian handicrafts and not be ripped off at the same time, that’s where we head from GUM. Izmailovsky market, is essentially a flea market and though the neighbourhood looks gritty and worn out, the outdoor market is delightful and would’ve been a highlight of my Moscow trip, had we been there on time. But it’s almost seven and the shops are winding up. 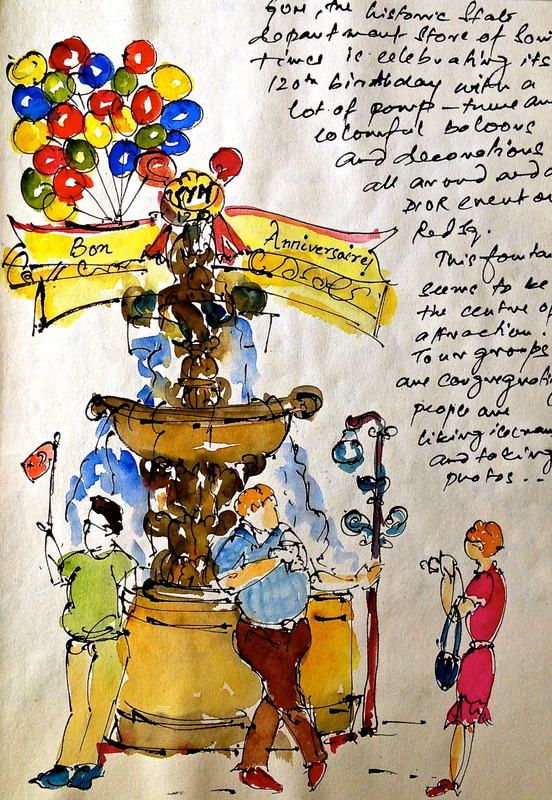 Without the crowds flocking in and out, without the frolic, the smell of shashliks, the histrionics of the vendors, the back and forth haggling of their customers, the squeaking and squealing of children, the market seems feeble, inept, perhaps drowsy. Among empty shelves and hollow cleaned out shops , we pass by a few that are still heaving with blue-eyed Matryushkaya dolls in traditional to comic avatars, glistening lacquerware and innumerable Soviet kitsch – badges, lighters and the like. 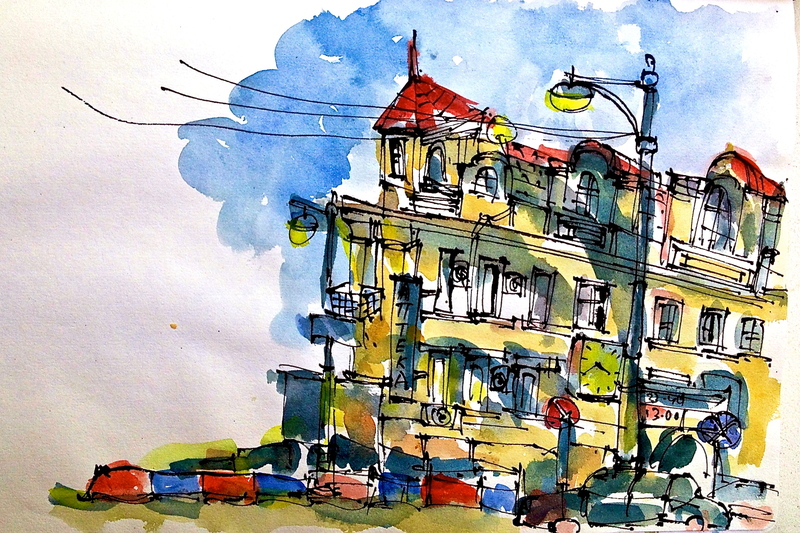 After what seems like an eternity, we emerge with our loot at one-third the price of those selling on the charming pedestrian street – Ulitsa Arbat, where we spend the rest of our evening, strolling lazily while scouting for a dinner joint. 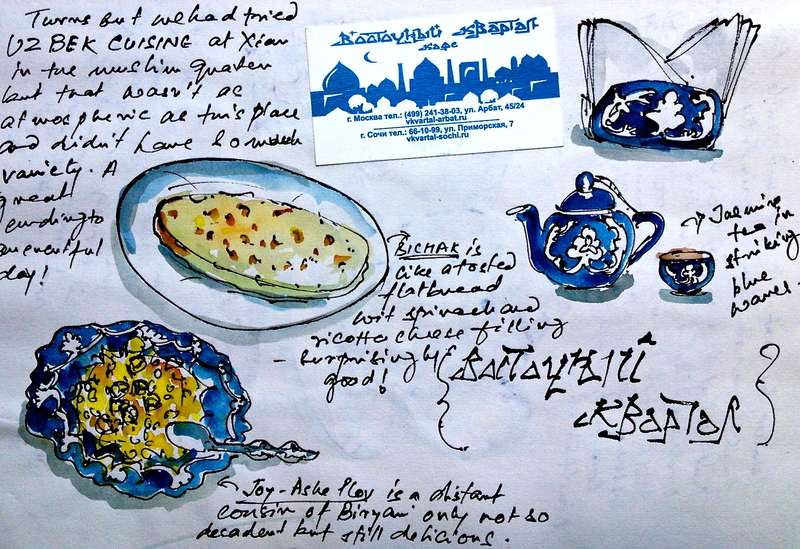 Given the popularity of restaurants serving cuisine from the former Soviet Republics – like Georgian, Armenian, Kazakh or Uzbek , the task at hand isn’t difficult, rather a matter of choice. Vostochny Kvartal at Ulitsa Arbat 45/24 has a pretty outdoor seating with carved wooden furniture matched with bright mood lifting upholstery and folk music. The English menu, perhaps the only copy at this Uzbek restaurant, takes a while to arrive as it makes the rounds at the other tables. ‘Bichak’ – essentially fresh spinach and cheese salad stuffed inside a toasted flatbread – serves as the perfect appetizer, followed by ‘Plov’ which seems like a distant cousin of Biryani minus the grated carrots. 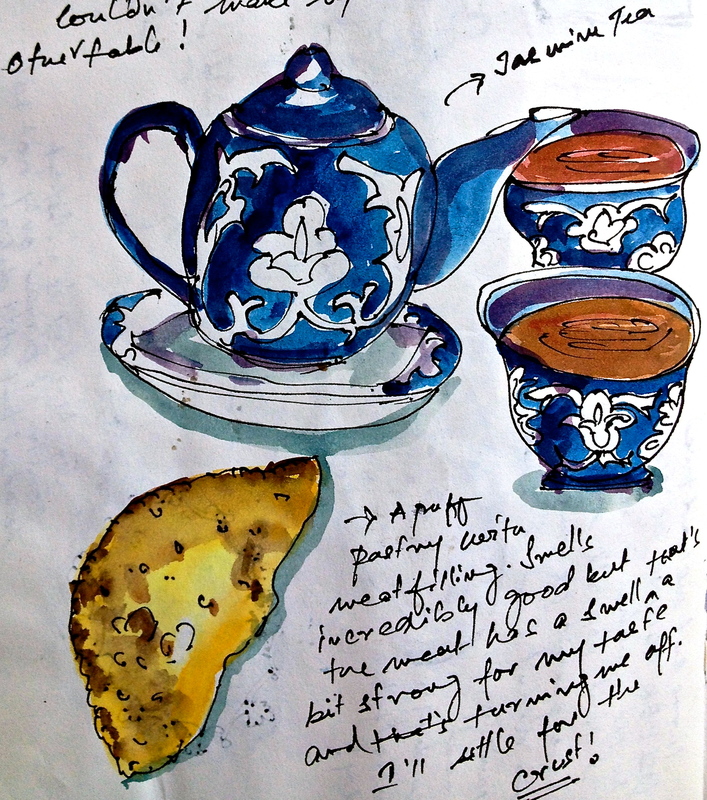 We cleanse our palate with fragrant Jasmine tea served in provincial aquamarine ceramic wares with alluring pattens, which I cannot help but sketch. Temur, the waiter approves with a shy smile and a nod. 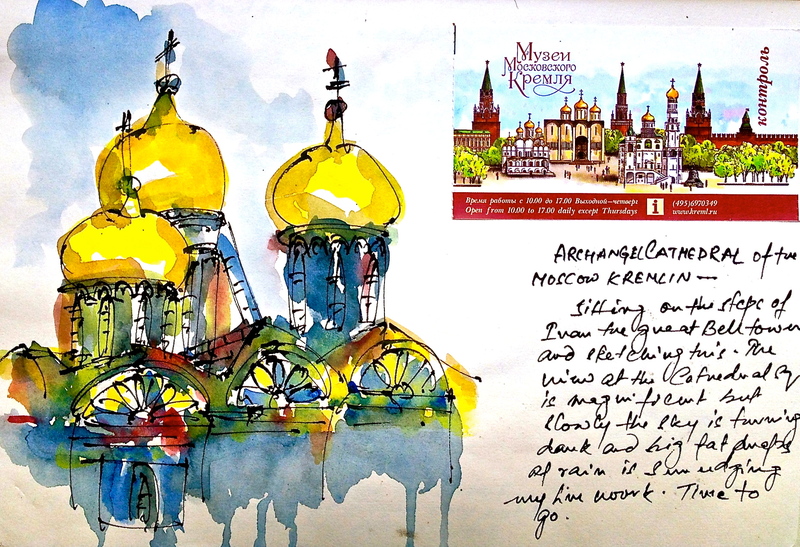 This entry was posted in Travel Vignettes and tagged Annunciation Cathedral, Archangel Cathedral, Cathedral of Assumption, GUM, Ivan the Great Bell tower, Izmailovsky Market, Stolovaya No.57, Uzbek, Vostochny Kvartal on August 1, 2013 by Somali Roy.